With the start of New York Fashion Week almost upon us, we somewhat selfishly decided it would be an opportune time to do some research on the best tricks to make standing in heels for hours on end a bit more bearable. Ahead, the top seven ways to make sure you’re not hobbling home from your next big night out, wedding, or concert. Scroll down to check them out, and shop our favourite pain-free heels. 1. Chunky heels are your friend. Stilettos are often uncomfortable because they place so much pressure on a very tiny heel. Chunky heels have a wider base, allowing for a more even application of pressure. 2. A platform is always a good idea. Platforms offer the same benefits as shorter heels (reducing the distance your heels are elevated above the balls of your feet) without sacrificing height. 3. Wear shoes that cover the top of your foot. Heeled boots or heels with a thick strap over the stop of your foot hold your foot steadier in your shoe. This helps keep your feet from sliding forward as much, which will help prevent toe blisters. 4. Switch into a different pair of heels. Different heels have different pain points—perhaps one always creates blisters on your heels while a different pair always crams your toes. Switching to a new pair half way through the day will help alleviate some of the pain that comes from standing in the same heels for many hours. 5. Shift your weight to the outside edge of your feet. 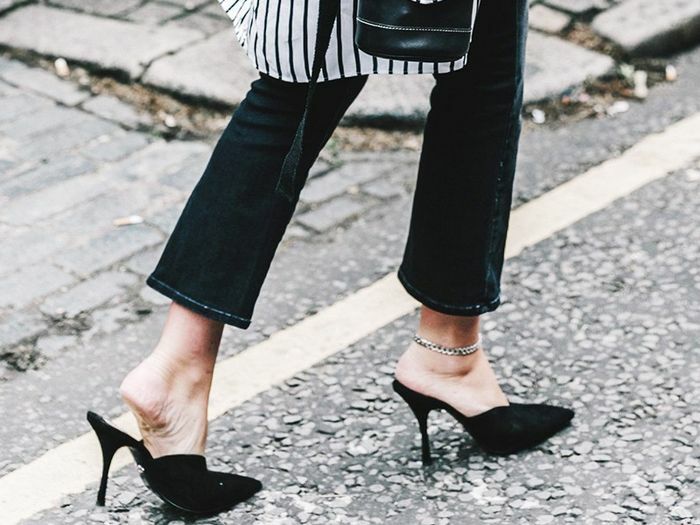 According to Vogue’s shoe expert, Yamuna Zake, you should try shifting your weight toward the outside edge of your feet if you plan to be standing for a long time. This will take some of the pressure off the arch of your foot. 6. Invest in quality shoes. Quality shoes offer a lot more support, padding, and comfort than cheaply-made shoes. They also mould to your feet better (if you’ve ever walked in inexpensive heels, you’re familiar with the rigid, cardboard-like feel of them), which makes it easier to walk. 7. Do exercises that help strengthen the foot and alleviate pain. Check out the 7 best exercises for women who wear heels. We bet you haven't heard this Olivia Palermo-approved trick for alleviating foot pain.